You stage your space meticulously. Get the lighting just right. And plan a smooth path through the entire space before you scan. Why? Because pre-planning is key to creating pristine Dollhouse and Floorplan views, with a smooth and seamless Inside walkthrough. If you’ve created online virtual tours with Matterport before, you know that this kind of attention to detail creates the best models and elevates the 3D showcase experience. But, there are some times when even the most meticulous scanning can’t get rid of “holes” or dark areas in the 3D mesh where the Matterport Pro Cam was unable to record data. So what’s a fastidious Matterport user to do? Fear not. “Hole filling,” as we like to call it, has been significantly improved with a powerful new algorithm added to our vision software. Added just a few weeks ago, this new algorithm is already reducing holes in your 3D data, enabling smoother transitions, and reducing awkward movement through solid surfaces. Whenever you scan a space, we encourage you to scan thoroughly, and scan even small rooms from multiple points. Later, you can turn off extra scan positions in Workshop, which is far easier than trying to return to a location to scan missed areas. Obviously, there will always be times when you can’t get behind a couch or fit into a tight space, which can lead to dark areas or “holes” in the 3D mesh. 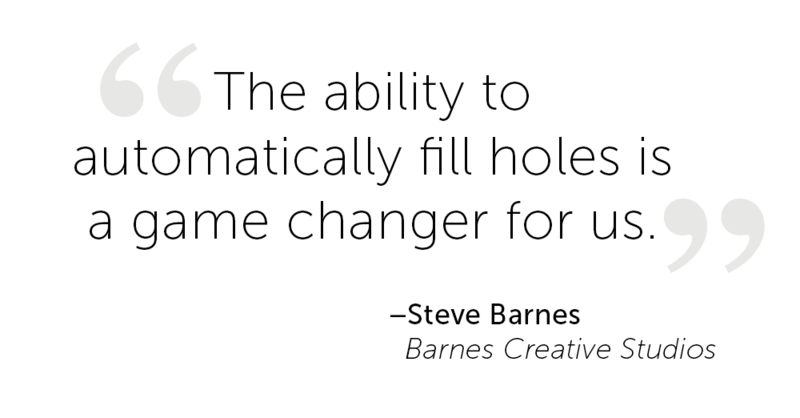 We know this is a bummer, which is why automatic hole filling is such a great enhancement for our users. The newest version of our vision software intelligently guesses at what the missing spatial data should be, filling it in with texture and color deduced from the surrounding surfaces. When you have a complete mesh free of holes, the Inside view navigational experience is smoother, because the photos are mapped onto the proper places in space. This means that they appear like the real objects would appear if you were there in person; thus, improving transitions. The improvement is also very noticeable in Dollhouse and Floorplan views, where we are now able to eliminate many of the dark holes that would otherwise appear where there was no spatial data. Hole filling also means that we’re able to intelligently fill in walls and floors, to reduce situations where a user might move through walls or through floors because of an absence of 3D mesh. We really appreciate all the positive feedback we’ve received on this new capability, but you should know that our engineers are hard at work at making hole filling even better, and we expect to release additional enhancements later this year.